As a part of our community project of bringing yoga awareness, Yoga Bharati conducts Yoga Yagna (Yogathon) every year during summer and winter. Surya Namaskar (SN) is one of the core practices of Yogathon. We offer to train the participants FREE of cost to be able to join this Yogathon. This article attempts to give you a overview of the benefits of SN and the research behind SN. Best Energization Technique -Suryanamaskar brings a unique dimension to yoga. It energizes the body through a combination of stimulation and relaxation techniques. It can be singularly useful for people with either Tamas (inertia), Rajas (hyperactivity) or Satva (balance). In every human physiology, we have both stress response and relaxation response but we do not seem to have control over them. Yoga, and especially Suryanamaskar, brings a voluntary control over this involuntary capacity of human physiology and personality. Breath Work – The alternate expansion and contraction of the chest helps in regulating and deepening the breath through the practice. For a novice yoga practitioner, it is hard to synchronize breathing with body postures. Regular practice of Suryanamaskar is the best way to learn the breath synchronization aspect of yoga practice. Sense of body awareness – We are usually not aware of our bodies all the time. If we were, we would be sensitive to our posture, our discomforts and thereby avoid unnecessary wear and tear and be able to detect the onset of diseases. SN practice enhances this body awareness and improves overall quality of life. Sense of mindfulness – We do most things mindlessly. Once we learn something, it becomes mechanical and then we are mindless about it. Improved body awareness automatically leads to improved mindfulness. SN practice helps immensely in developing this capacity of mindfulness in everything we do. When we are mindful, we commit less mistakes and there are less chances of accidents and we have better control of our emotions and reactions. Social Transformation – A mindful person is by nature more aware of other people’s feelings and hence tends to exhibit more empathy and kindness. Regular SN practice not only helps individuals with their personal health but benefits the entire society by moving people towards a more harmonious life one individual at a time. Overall Physiological Benefits - Cyclic Practice of yoga poses in SN helps to loosen up joints and muscles in a short period of time. Abdominal organs are alternately stretched and compressed. This ensures proper functioning of the organs. SN removes nervous tension and anxiety due to the dynamic nature of the practice. This practice also has a profound positive effect on the back as it involves alternate backward and forward bends. It also improves spinal flexibility and results in improved immunity. Due to a beautiful combination of variability and repetitive nature of SN, it allows individuals to do self-motivated practice without getting bored or mindless and it allows for easy self-maneuvering since it is repetitive in nature. Adding Mantras during the practice removes monotony, provides harmony within and produces soothing vibrations that removes fatigue. Mantras act on various chakras resulting in overall spiritual benefits to the yogi who seeks to grow in spiritual sadhana (practice). Mudras like Namaste and poses like Ashtanga bring humility and remove self-binding ego in the practitioner. Salutations to Sun, the visible divinity in nature allows the practitioner to practice with devotion (shraddha and bhakti). Visualizing the Sun in our heart center brings a sense of peace and wholeness. Surya Namaskar or Sun Salutation is a series of 10 or 12 poses in a continuous flow, synchronized with the breath. Perform this series every morning and evening, and more if you desire. As always in yoga, practice slowly and consciously. If you practice only a little yoga each day, practice Surya Namaskar. For people with limited time, the Surya Namaskar exercises every muscle and joint while stimulating the body. Surya Namaskar is performed to give reverence to the internal Sun, the creative force that radiates inside the body, and the external Sun, which shines outside the body. Along with our own practice, help us spread awareness of Surya Namaskar and yoga to your near and dear and make it a part of your life. What is Yoga Yagna - Yogathon? Yagna means sacrifice. In Indian tradition, there is a havan or yagna kunda where the entire community offers their own contribution to the havan kunda. Yagna brings the community together for a noble cause and builds confidence in the community in their ability to reach a difficult goal. This can be compared to the tradition of Marathon in the west. Yoga yagna is a Marathon where an individual will set a goal and practices regularly everyday and will gradually increase the time duration, number of poses or chantings per day to reach the goal. The idea is to reach the goal with dedicated practice during the yagna period. Most of the ancient cultures worship the Sun. The Greeks called the Sun god Helius, the Romans referred to him as Titan and Hyperoin, the Egyptians called himRa (Ra-Atum-Khepri). In Mexican culture, he is Kikich Ahau. The Germans call the Sun Sol. In Chinese culture, the Sun represents YANG (Pingala) and the Moon represents YIN (Ida),the basis of everything in nature. Through the practice Surya Namaskar, we offer our salutations to Sun, surrender our ego, accept that the cosmic energy is the main factor in our survival and drives the universe. Although I as an individual may be achieving success, name, and fame, attributing it to the larger factors that are responsible for this success makes us feel humble and grateful. Can people with health conditions such as back pain and hypertension practice Suryanamaskar? Yes with modifications. Please consult us for modifications. For hypertension participants, if the condition is under control using medications or by natural methods, you can practice SN. But please consult your yoga teacher and your doctor before beginning the practice. What are the different ailments that are helped by Suryanamaskar? Yoga Bharati yoga therapy classes provide variations for different health conditions so as to enable most of the people with minor health conditions to practice Surya Namaskar. Listen to your body, listen to the instructor and follow the advice of your doctor and the yoga instructor. Diabetes – One of the best techniques to help manage sugar level is SN practice. It provides physical practice, breath synchronization and helps them relax. The alternate stretching and compression of the abdomen region stimulates the pancreas. Hypertension – One can practice SN if one’s Blood Pressure is under control, however, the practitioner should reduce holding of the poses where the upper part of the body is inverted (eg: forward bending). Sleep Disorders – Surya Namaskar is known to be very effective in people with insomnia. Children with ADHD or Autism spectrum – Once SN sequence is taught, children can practice regularly and it is very helpful way to keep them focused and motivated to practice yoga which is otherwise boring for them– Chanting and breath synchronization help them improve their focus and concentration skills. Back Pain – With slight variations, people with mild back pain and without structural issues of the spine/vertebrae can practice SN. Note: people with back pain should not hold the postures too long. They can flow through the poses. SN practice helps in generating endogenous pain killers right in the body’s chemistry itself. Heart Conditions – People with heart disease are recommended to do Surya Namaskar after taking doctor’s advice. Note of caution: consult your doctor before beginning. Anyone with normal health including kids who can perform the practice. At home, at work, parks, yoga classes and wherever you can. For Yoga Bharati organized classes visit our classes page. How do I follow Surya Namaskar Yagna (SNY) Practice? Please set a realistic, yet challenging goal for yourself, be committed to your pledge and complete your goal every week. Make it a New Year resolution to practice SN every day. Every day practice ten or twelve SNs at a stretch in the morning or evening (preferably in the morning). Please keep count of the number of SNs you practice every day. Gradually increase the count every day/week. Any Dos and Don'ts in SN Practice? Must be performed with empty-stomach. Ideally 4 hours after a heavy meal or 2.5 hours after breakfast. Women may avoid or practice with caution during peak menstruation period. Avoid the practice during second and third trimesters of pregnancy and you can resume 6 weeks after normal delivery or 2 months after C-section after consulting the doctor. Surya Namaskar Modified practice for people with shoulder pain and wrist pain. 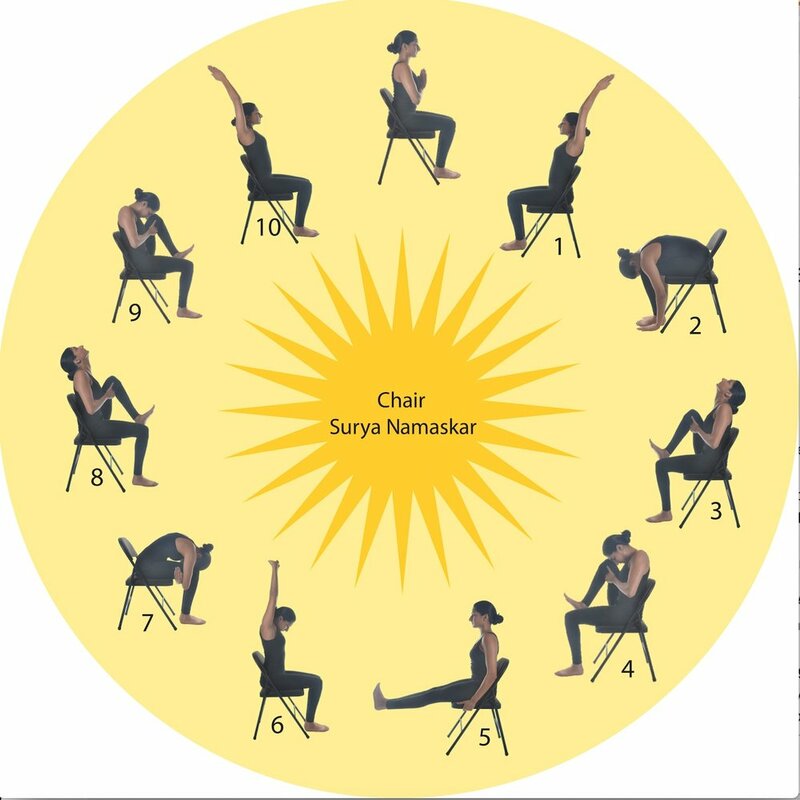 Classic 10 step Dynamic Surya Namaskar. People with back pain with no structural issues can practice with knee softening during forward bends, or forward bending squats during steps 2 and 9.